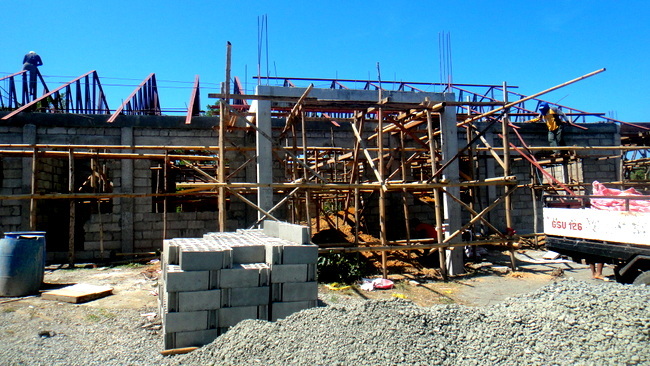 Here’s the latest progress report on our new home in the Philippines on the mango island province of Guimaras in Western Visayas were we reside. Construction is going into Week Five and the following pictures were taken only a few days after the latest post regarding this enterprise. Our new house will be the dwelling for five people and covers over 3,000 square feet. It will have four bedrooms and four corresponding CR’s, Comfort Rooms, one for each bedroom which will include a guest bedroom. Work on our new garage has begun (see next photo) and the concrete for the garage roof, which will serve as a terrace, will be poured this week. Our Foreman Boy requested a lunch for the 20-man crew for this event, which means a lot of extra work for my asawa, who is already in charge of ordering materials and taking care of the crew’s payroll. I suggested hiring a local caterer but my wife insists on saving money and doing it herself. When she’s made up her mind about something, I’ve learned it’s best to let her do it her way and move on. After over 15 years of marriage to a Filipina I’ve learned a few things and choose my battles (and my words) carefully. You married guys know what I’m talking about. 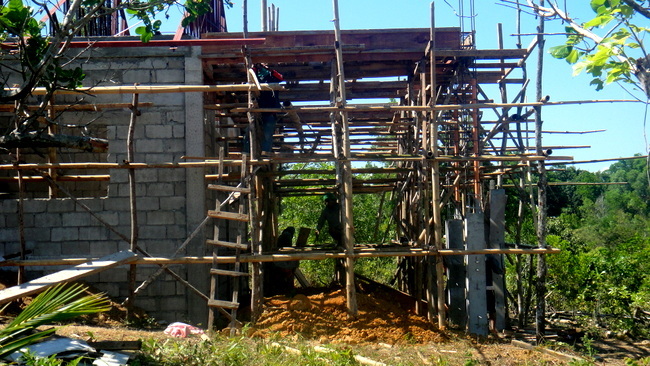 The steel trusses for our new homestead have almost been completed. 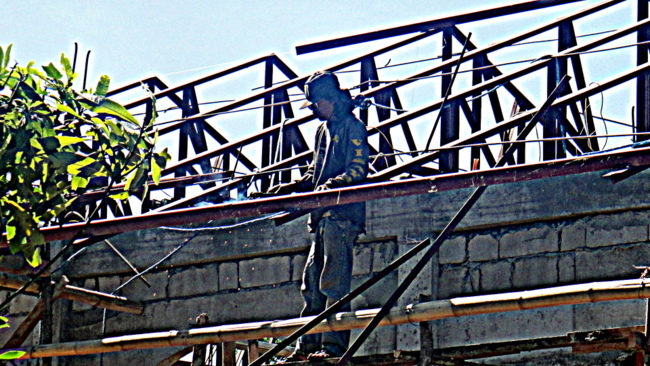 This is one of our welders who is putting the finishing touches on the trusses. Our foreman informs us that he will be measuring the roof this week and we will start taking bids for the new roof. 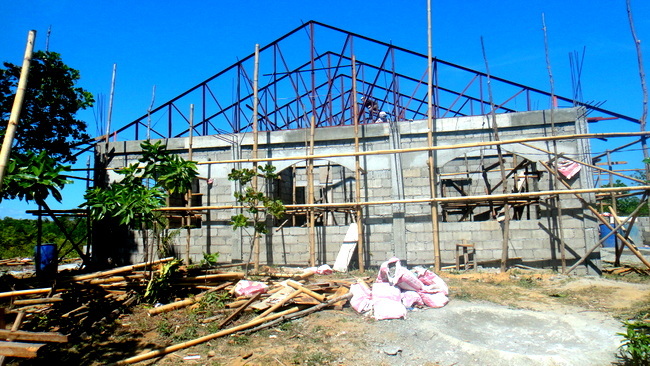 My wife informs me that we will have a thicker material that we had used on our home at “The Compound” five years ago where a new roof and CR were built not long after our move to the Philippines. 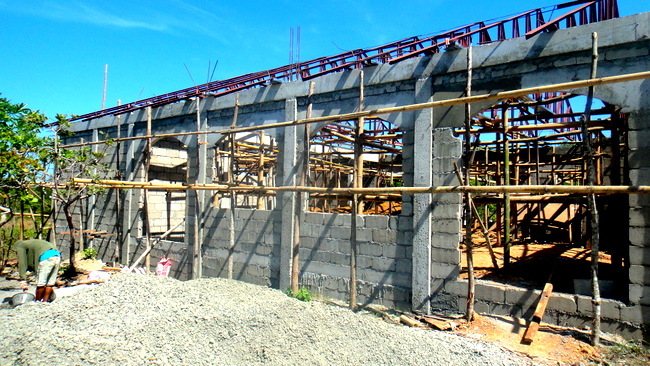 Our lead man also has told my asawa that the electrical materials for our new domicile will also be ordered this week. While our foreman advised my wife that his electrician could order the materials my wife deferred and informed our head guy that Joery, our brother-in-law who supervises a separate side crew of three, himself included, is capable of ordering the necessary electrical supplies needed. My wife knows that in many cases the cost of materials will be inflated if those materials are ordered by others, especially when a foreigner is involved. 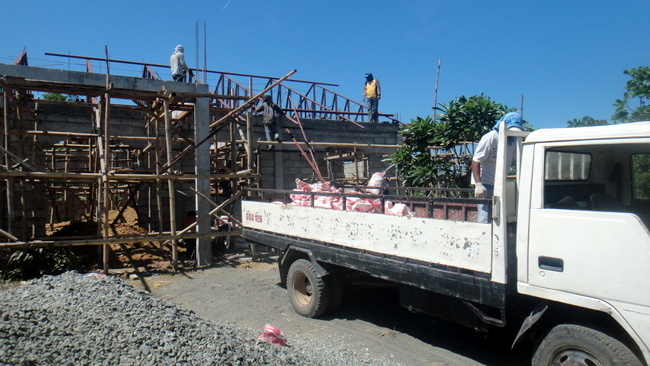 Though our foreman receives a daily salary of 600 pesos, 13.63 USD, for his oversight, he also will receive an additional 35% bonus for the electrical and the roof work done as part of our agreement. Joery, who has done wiring for us in the past, will canvass different retailers in our area and get the best possible price. Now, that said, that does not mean our foreman would have done that. I met his electrician yesterday afternoon, after this post was written, and I trust the man 100 percent but my wife still wants a list of the material needed. 60 loads of dirt will be needed to fill in the interior of our new residence. 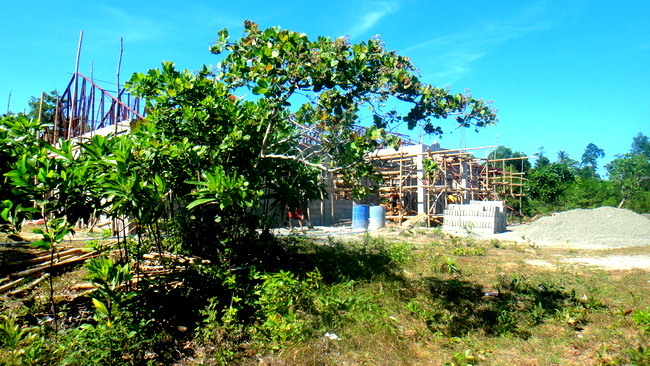 Our new home in the Philippines is located on an elevation about 300 meters from our road and was not built on entirely level ground in order to gain a better view of our rural area and to allow us some privacy from the road. Our foreman gave us the best price per load, 1400 pesos, 32 US Dollars, so we are using his outfit to deliver the soil which is hauled over in used concrete sacks in order to make it easier to dump the dirt at our site. Yes, it would be easier to use a dump truck but keep in mind that this is the Philippines and Guimaras is a small provincial island. You adapt to the circumstances and adjust your Western way of thinking. If you don’t, you’ll cause yourself a lot of unnecessary frustration. Here’s a look at the arched windows that our new digs will have. 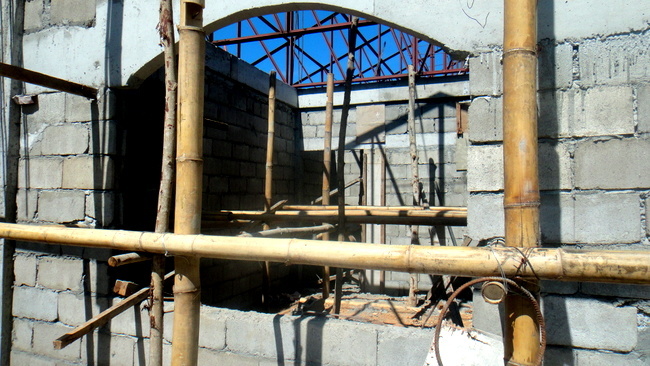 The windows are my asawa’s idea and they add a nice architectural detail to our new home. Close-up view of the one of the windows. The windows will have metal screens placed over the glass eventually and bars will be added for extra security. Will it make the house like a prison? Probably, but we are in a remote rural location on this mango province and any extra security precautions are a matter of good common sense in my books. Work is progressing nicely on our new entry way and porch as shown in the next picture. Our foreman has been on site every day we visit and the 20-man crew are always working. My wife and I are very pleased with the progress thus far. I honestly didn’t expect so much to be done at this point. I even saw one of the workers starting to put the concrete finish on one of the interior walls. At this point, I think it’s even possible that the project, expected to take five to six months, could be finished even sooner. 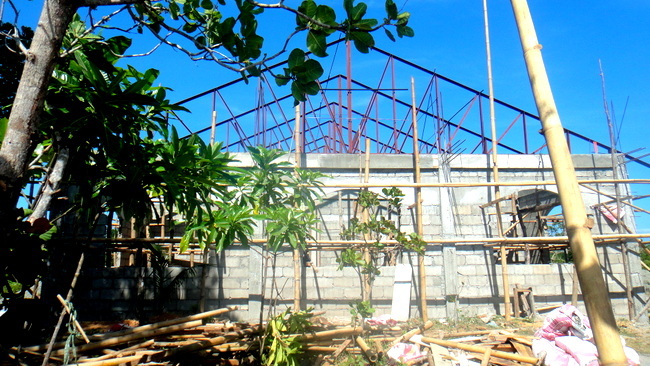 A long shot view of our new home in the Philippines, where even the permit process is going smoothly thus far. 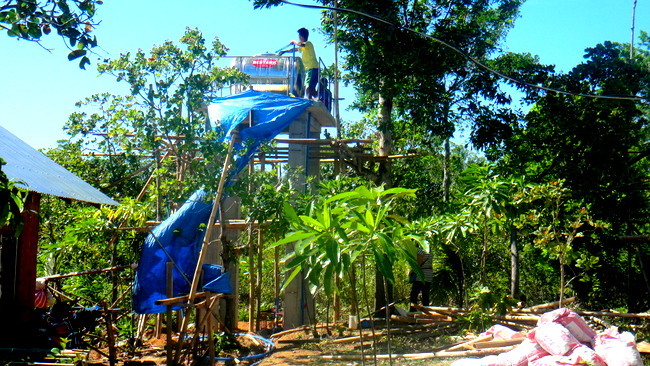 Brother-in-law Joery and his crew have been busy on the side projects and have gotten our water tank perched on the concrete tower platform they built. The tank, located next to the nipa hut for my father-in-law, will be supplemented by a well that we will have dug later this month. Joery, John and Gerry have also been busy working on a barbed wire fence that will surround our 1.25 hectare property. After the water tank project and fence are completed, they will begin work on a dirty kitchen which will also be the home for my new stainless steel barbecue grill. Though I’ve kept my nose out of the construction thus far, I will be supervising my outside “man cave” area, rest assured. You are right it could be done early. That would be nice. I think you guys are very fortunate to have a great crew. Yes, we are very fortunate, Papa Duck. Would be great if you guys could visit us once it’s done. Just wanted to jump in and say HI… we spoke about a year ago.. when I wrote you and asked about moving there… my husband still will not take early retirement.. although he is a Philippine citizen, and we could easily live on my $3200+.. while waiting for his SSI to kick in… any convincing words you can offer to get him to think again… He is from Iloilo and we have a house in OTON… so that’s not a issue.. but am trying to convince him to sell and build a newer one… Hope to get there before I die…!!! You seem to be doing well the new house looks like it will be beautiful… glad to see you are still doing well… hope to hook up when I visit in January.. if you would consider doing so… PS: Threatened him today that I may have to go alone if he doesn’t start taking my wanting to move more seriously… LOL!! Hi, Christy, sure I remember you. Thanks again for buying my book. You could live like royalty on the income you already have available. I wish there was something I could say to convince your husband. Oton is a nice are, I have a Canadian friend that built a house there. I personally could not stand my job after almost 30 years and jumped at the chance to retire early. We will have to take you on a tour of the new house when you visit. I sincerely hope you can convince your husband to make the move now. Is he afraid of being too near the relatives, which sometimes can be a problem? Good luck to you and take care. 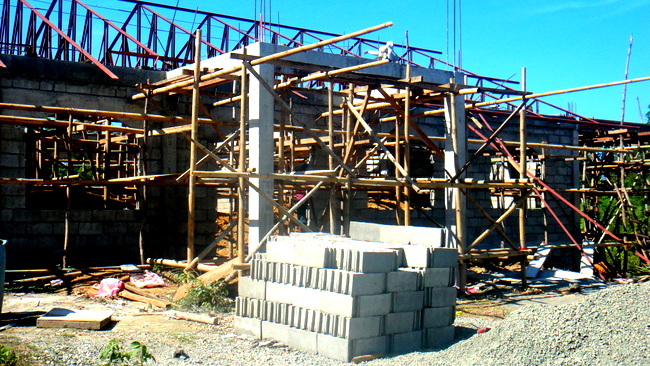 It looks like you have a very good crew hard workers that’s a big plus,keep up the good work Derek in sunny pasig. Yep, we’re a couple of lucky guys, Derek. Sounds like both of our wives have a lot in common. The crew is doing great and we’re very happy with them. My wife and brother-in-law bought all of the electrical supplies our electrician requested yesterday and the wiring will begin this week. Shouldn’t be too long before we order the roof. That’s a superb “hut” you’re having constructed~! I too have a place in Palawan, and a nice wife there too. Still trying to get over there, but it’s coming soon. Glad to see you’re happy and safe there in the islands. America is slowly going to pot. Sorry to say. ps. I found your website during a search for a good way to go, regarding permanent visa or other. Now I’m not sure what to do, but I think I’ll do just that, as you have done. Any more thoughts? Glad you found this website, Ray, I appreciate the comment. My wife has a brother over in Palawan and we plan to visit there once our house is built. America? Man, I get the news from there every day. All I can say is that despite all of its faults, I’m glad I’m living in the Philippines. Permanent Visa? Some of my readers, such as Papa Duck, obtained his in the States before arriving in the Philippines. My wife sponsored me for mine a few years ago but I had to go to Manila at the time to do all the paperwork on it. If possible, I would advise getting your permanent visa before you get to the Philippines and save yourself some hassle. Take care.